Ahead of her participation at the Luxury Law London Summit, we caught up with Stephanie Crespin, Founder and CEO of luxury resale site, StyleTribute, to discover her take on the big trends affecting the luxury sector. 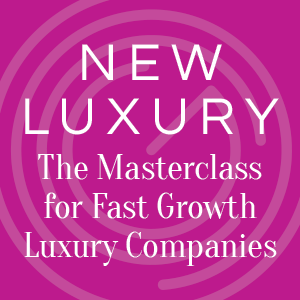 LLS: What do you see as the key challenges and opportunities facing the luxury sector over the new few years? Environmental issues and increasing consumer consciousness will push the luxury industry to rethink their existing business models. Sustainability needs to evolve from being some topic in a marketing-focused CSR initiative to a priority integrated across the companies’ value chain, integrated into the entire business decision making and planning of a company. Keeping up with the digital transformation. Luxury brands were late to catch the internet/digitalisation as they assume that the quality and magic of their shopping experience can only be maintained offline and that the internet impacts the exclusivity aspect of their brand. However, consumers are today increasingly choosing a multichannel/omnichannel buying experiences and spend less and less time in store and more and more on the internet. Innovations like the block-chain will help the luxury industry curb counterfeit, a 450B market. Blockchain will also drive improved transparency and traceability across their value chain. New business models such as the 2nd hand market or Rental business are growing at an unprecedented pace. The brands who will pioneer in this space will reap the benefits of a strong competitive advantage. Adapting to the growing millennials segment and meeting their shifting values (millennials and Generation Z will represent more than 405 of the overall luxury goods market). Their values are different when it comes to luxury and their perception of this category. Their expectations have also changed, luxury no longer means only heritage or classism, they are looking for brands that can deliver quality, innovation, creativity and sustainable products. Brands that efficiently embrace the new generation’s shifting cultural values and consumption habits will be winning this new generation’s mind and heart. LLS: Why do you think it’s important to bring together in-house legal counsel and law firms to discuss the business challenges facing the luxury sector at the Luxury Law London Summit? SC: The fast changing environment in which the luxury industry is growing, is confronting it with new models and innovations. The overall digital transformation has been a key driver of legal questioning and uncertainties. The overall need for more transparency and customer expectations on the ethics of a company has also driven new legal questions. LLS: What do you see as being the biggest ‘buzzword’ in the luxury sector right now, and do you think it deserves the hype? SC: I’m completely biased but I would say Circular economy and Resale – and I would say it deserves further hype and beyond excitement, it needs action! LLS: Increases in technology offer a range of opportunities for luxury brands. What impact do you foresee blockchain and AI having? SC: Curbing counterfeit, improved customer service through personalisation for instance and better customer understanding and improved transparency of the sector. LLS: Online retail is also opening up a space for luxury resales. Does this ‘vintage’ aesthetic detract from the luxury experience or does it create routes to a previously untapped market? SC: Of course! A possible answer to a circular model and improved business model of the entire industry. LLS: What do you feel brands should be doing to prevent counterfeiting in an increasingly digital market? Today brands have no visibility on the journey of their product beyond the sale. Reflaunt brings in the solution and allows brands to trace their products throughout its life cycle. Each item sold through Reflaunt receives a digital id, placed on a block-chain, enabling the brand to connect with its owner, regulate its brand image and address the issue of counterfeits. LLS: What is your top tip to help a luxury brand best protect its reputation online? Each product sold through the Reflaunt receives a certification based on block-chain technology, a) strengthening the protection of legitimate and official brand distributors/owners, b) ensuring transparency of the product’s journey, from its origin to its entrance on the 2nd hand market, c) improving trust among all buy/sell activities for valuable goods. LLS: If you could give one piece of advice to a luxury entrepreneur starting in 2019, what would it be? SC: Luxury brands should stop clinging to their past and their heritage and should stop fearing change and innovation. Creativity and innovation are what gets a brand into the luxury game. Check out our full agenda for more information HERE.